Tool steel is comprised of a number of alloying elements that provide benefits to the iron base. Below is a listing of the common elements found in alloying tool steel and high-speed steel. The chemical symbol, atomic number, type of metal, atomic weight, density and melting point are listed. Iron is the base metal of all steel grades. It is a soft silvery gray lustrous metal.. Iron, carbon and many other alloying elements are combined to form tool and high speed steels. This is the most important and influential alloying element in steel. Without carbon, steel would not exist. Carbon is the element that combines with the other elements to provide hardness and strength. With increasing carbon content, the strength and hardenability of the steel increases, but its ductility, machinability, formability, and weldability are decreased. Manganese is used as a deoxidizer. It contributes to strength and hardness, but to a lesser extent than carbon. Manganese imparts a deeper hardening depth. Manganese has a strong effect on increasing the hardenability of steel by reducing the critical cooling rate and can reduce heat treating distortion. Silicon is used as one of the main deoxidizers in steelmaking. Silicon is a strong promoter of hardenability and increases scale resistance. Silicon helps improve toughness and provides a greater depth of hardening. For most steels a maximum limit is specified to control the level. Sulfur combines with manganese to form manganese sulfides. which is one of the undesirable inclusions found in steel. Sulfur is intentionally added to improve machinability by increasing lubrication and small chip formation. Nickel is a magnetic silvery-white lustrous metal. In combination with chromium, nickel produces alloy steels with greater hardenability. Nickel is not a carbide former. Nickel adds corrosion resistance. This is the most effective and frequently used deoxidizer in steelmaking. Small additions are used to insure small grain size. Aluminum will form with nitrogen and form hard aluminum nitrides, which is why it is added to nitriding steels. Cobalt improves red hardness and high temperature strength, It is frequently used in high-speed steels, hot forming tool steels, and high temperature materials. Cobalt does not form any carbides. Chromium is a steely-gray lustrous hard metal. Chromium is generally added to steel to increase resistance to corrosion and oxidation, to increase hardenability, and to improve high temperature strength. Chromium is a carbide former, which increases edge retention and wear resistance. Molybdenum is a silvery white metal usually alloyed together with other elements and is a pronounced carbide former. It increases temper brittleness and promotes fine grain formation. Molybdenum also increases weldability and increases the tendency for secondary hardening during tempering. Tungsten is steel gray metal that is an excellent carbide former. It improves toughness and prevents grain growth. Tungsten increases high temperature strength and red hardness. It is primarily used in high speed steels and hot forming tool steels. Vanadium is a silvery gray metal. It is an excellent carbide former, which increases wear resistance. It forms the highest hardness carbides. It increases high temperature strength and resistance to softening. 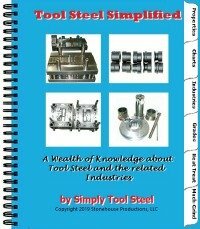 Now that you have an understanding of the common alloying elements found in tool steel, lets take a look at how those elements form the Properties of Tool Steel . You may also want to take a look at the chemical composition on the Data Sheets.